Barangay Health Workers and Barangay Nutrition Scholars are tasked with monitoring growth of infants and young children. In the Philippines, this program is now called Operation Timbang Plus (OPT Plus). OPT plus and has its roots back in the late 1970s when both the NCP and the National Nutrition Council was led by NCP's founding director. OPT Plus is meant to "generate data for nutritional assessment, planning, management and evaluation of local nutrition programs". This means that the government wants to use it to find children at risk as well as to have meaningful data for planning at the local level. NCP continues to support the OPT Plus as long as it remains a government program. With this product, we seek to contribute to improving the quality of data collection. 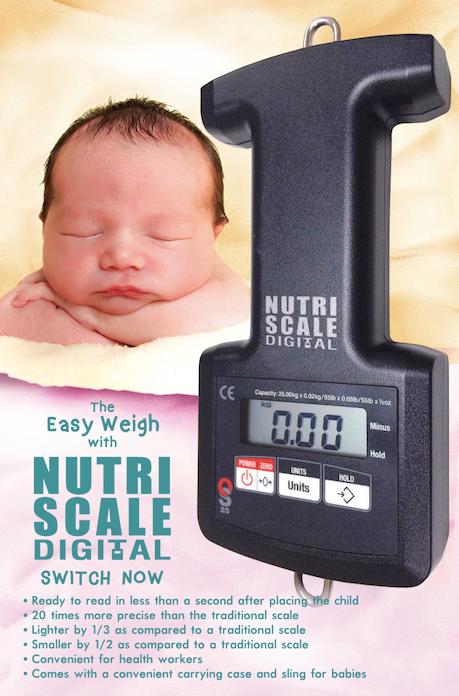 The Nutri Scale Digital is easier to read than the analog dial scale. It has better precision and accuracy. We are sure that the BHWs and the BNS will appreciate that the scale is lighter and easier to bring. Watch out for our paper on the diagnostic performance of the Nutri Scale Digital.